BUCHAREST (Romania), March 12 (SeeNews) - Romania's annual consumer price inflation rose at 3.8% in Febrary, from 3.3% in the previous month, data from the national statistical office, INS, showed on Tuesday. Food prices rose 4.46% year-on-year in February, while non-food prices increased 3.74%, INS said in a statement. Prices of services grew by 3.08% in February. On a monthly comparison basis, Romania's consumer price index (CPI) rose 0.79% in February, as food prices rose 1.27%, non-food prices edged up by 0.57%, while prices of services rose 0.55%. 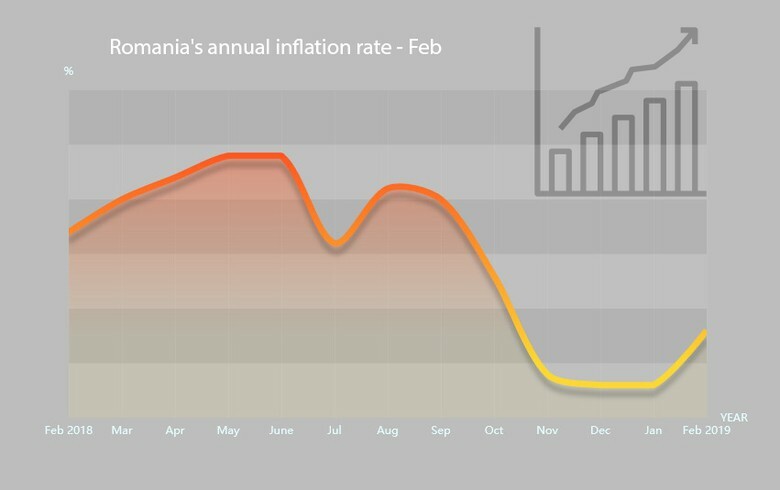 In February, Romania's central bank (BNR) raised its annual inflation forecast for 2019 to 3% from 2.9%, within its target band of 1.5-3.5%.